Product #3797 | SKU KUMO1604 | 0.0 (no ratings yet) Thanks for your rating! 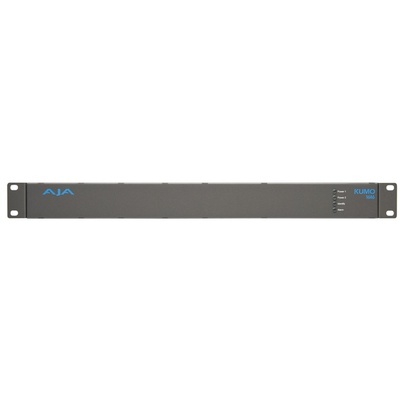 The award-winning AJA KUMO 1604 Compact SDI Router is a small, cost-effective solution for a range of broadcast, production, and post-production applications. With 16 SDI inputs and 4 outputs, the KUMO 1604's embedded Linux operating system and internal Web server provide Web browser control with no need for additional software. Simply instal, configure, and you're ready to go. The unit's compact 1RU size makes it perfect for edit suites, mobile sports trucks, and corporate video installations, while its HTTP, SNMP and RS-422 support give you a wide range of powerful control options.